Savitribai Jyotirao Phule (January 3, 1831 – March 10, 1897) was a social reformer, who, along with her husband, Mahatma Jyotirao Phule, played an important role in improving women’s rights in India during the British Rule. Savitribai was the first female teacher of the first women’s school in India and also considered as the pioneer of modern Marathi poetry. In 1852 she opened a school for Untouchable girls. Savitribai was born in Naigaon village in Satara district to her mother LaxmiBai and father Khandoji Navse Patil, who was the village chief. Savitribai was just nine years old when she was married to JyotiRao Phule (age thirteen) in the year 1840. According to the Hindu calendar the tithi, or date, of their marriage was Falgun Vadya panchami, Shakey 1765. SavitriBai’s father-in-law, Govindrao Phule, was from Phursungi, with the last name Khirsagar. The Peshwa gave him a horticultural land in Pune, so he migrated to Pune and started a horticultural business. This was why he acquired the last name Phule, from the word phul, flower. (Many last names in India are acquired due to the family business). Savitribai’s husband Jyotirao lost his mother at a very young age. His maternal cousin sister Saguna (lovingly called SagunaAau by JyotiRao, Aaee = mother) nurtured him. SagunaAau worked as a nanny for a British officer’s son. She therefore understood and was able to converse in English. She used this knowledge to inspire JyotiRao. JyotiRao was thus attracted towards education. SavitriBai had been given a book by a Christian missionary before her marriage which she brought with her to her in-laws house. This shows the attraction she had for words and books despite being uneducated. SavitriBai set up a school for SagunaAau on 1st May 1847 in a backward community. This was their first school. SagunaAau started teaching there happily and enthusiastically. A year later when a school was started in Bhide Wada in Pune, SagunaAau was called there to teach. The first school had stopped working abruptly due to lack of acceptability for education for lower caste people in those days. Mahatma Jyotirao is regarded as one of the most important figures in the social reform movement in Maharashtra and India. He is most known for his efforts to educate women and the lower castes. Jyotirao was Savitribai’s mentor and supporter. Under his influence Savitribai had taken women’s education and their liberation from the cultural patterns of the male-dominated society as mission of her life. She worked towards tackling some of the then major social problems, including women’s liberation, widow remarriages and removal of untouchability. However, apart from all these oppositions, Savitribai yet continued to teach the girls. Whenever Savitribai went out of her house, groups of orthodox men would follow her and abuse her in obscene language. They would throw rotten eggs, cow dung, tomatoes and stones at her. She would walk meekly and arrive at her school. Fed up with the treatment meted out to her, she decided to give up. But it was because of her husband that she continued with her efforts. He told Savitribai that Jyotirao, who was working for women’s education, had started the first girls’ school and required women teachers to assist him. Jyotirao educated and trained Savitribai, his first and ideal candidate for this job of a teacher. Savitribai and Jyotirao faced fierce resistance from the orthodox elements of society for this. Jyotirao sent her to a training school from where she passed with flying colours along with a Muslim lady Fatima Sheikh. When Savitribai completed her studies, she, along with her husband, started a school for girls on 1st January 1848 in a place called Bhide Wada, Narayan Peth, Pune. Nine girls, belonging to different castes, enrolled themselves as students. Slowly and steadily, she established herself. Jyotirao and Savitribai managed to open 5 more schools in the year 1848 itself. She was ultimately honoured by the British for her educational work. In 1852 Jyotirao and Savitribai were felicitated and presented with a shawl each by the government for their commendable efforts in Vishrambag Wada. The next step was equally revolutionary. Savitri realised that along with education it was necessary to work on other social fronts, to build up the self esteem and confidence of women. She also campaigned against some cruel social practices. Many girls who were married off young would be widowed by the age of twelve – thirteen. After the death of their husbands, either they would have to take Sati (a practice of burning the widow on the funeral pyre of the husband) or their head would be clean shaven to make them ugly and unattractive to other men. These helpless women, with no rights to denial, would be easy targets for depraved men. The resultant pregnant widows would be scared of being ostracized by the society and the suppression that the child would have to suffer, and would resort to suicide or killing the new born.To counteract this situation, JyotiRao started a home for the pregnant widows and orphaned children to stop this carnage. Savtri ran the home capably. She considered all the children in the orphanage like her own. Savitribai and Jyotirao were moved by the plight of such widows and castigated the barbers. They organized a strike of barbers and persuaded them not to shave the heads of widows. This was the first strike of its kind. Savitribai was not only involved in educational activities of Jyotirao but also in every social struggle that he launched. They also fought against all forms of social prejudices. They were moved to see the untouchables who were refused drinking water meant for the upper caste. Both Jyotirao and Savitribai opened up their reservoir of water to the untouchables in the precincts of their house. Once Jyotirao stopped a pregnant lady from committing suicide, promising her to give her child his name after it was born. Savitribai readily accepted the lady in her house and willingly assured to help her deliver the child. Savitribai and Jyotirao later on adopted this child who then grew up to become a doctor. This incident opened new horizons for the couple. Many women were driven to commit suicide by men who had exploited them to satisfy their lust and then deserted them. Therefore, Savitribai and Jyotirao put boards on streets about the “Delivery Home” for women on whom pregnancy had been forced. The delivery home was called “Balhatya Pratibandhak Griha”. Jyotirao and Savitribai were also opposed to idolatry and championed the cause of peasants and workers. They faced social isolation and vicious attacks from people whom they questioned. After his demise, Savitribai took over the responsibility of Satya Shodhak Samaj, founded by Jyotirao. She presided over meetings and guided workers. In 1868 she welcomed untouchables to take water from her well. She also was the first woman to lit her husband’s pyre in the history of India. Savitribai’s poems and other writings are still an inspiration to others. Two books of her poems were published, Kavya Phule in 1934 and Bavan Kashi Subodh Ratnakar in 1982. Recently the Maharashtra government started an award in her name for Women Who Work Social Causes. Jyotirao and Savitribai opposed idolatry and championed the cause of peasants and workers. Both faced social isolation and vicious attacks from the people whom they questioned. Savitribai’s letters give us a good idea about the experiences of women during this social movement. On her death anniversary, a postage stamp was released by the Department of Post and Telegraph. 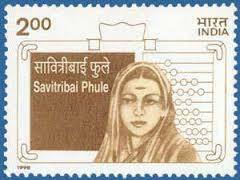 On March 10, 1998 a stamp was released by Indian post to honour Savitribai’s contribution. will you please provide us a ref. that govindrao phule is from Phursungi, with the last name Khirsagar. if any proof is available please share. otherwise change this statement because every where ref. is says that govindrao phule is from katgun which is in satara & their last name is gohre.